1.25mm pitch PanelMate™ prides itself in being a derivative of the 1.25mm PicoBlade with the same current rating and voltage but with an ultra-low profile design suitable for flat panel displays. 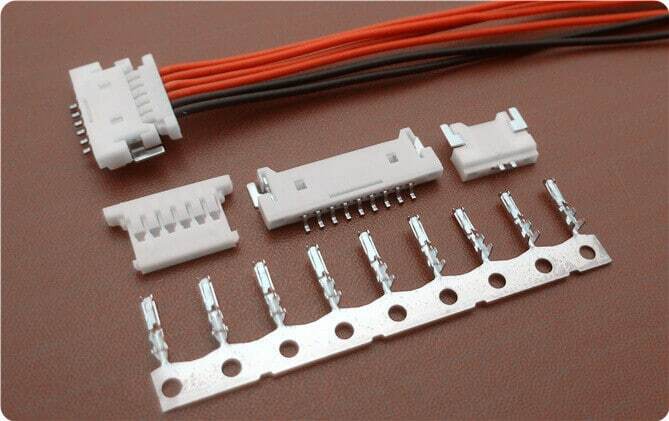 The main significance of this type of connector compared with other connectors is its very thin body consuming only a minimum height of 1.90 mm. This is designed for flat LCD displays such as entertainment displays, consumer electronics, personal computer and mobile devices in which sizes can be as low as 10 centimeters and below. Like the 1.25mm pitch connector, it is also suitable for densely crowded electronic devices due to its small diameter wirings and lightweight design. Scondar offers this 1.25 pitch PanelMate connector with overall dimensions of 6.2 mm x 9.47 mm x 1.8 mm with a mated height profile of 1.90 mm. Scondar also offers a variety of models for this connector with different number of circuits ranging from 2 to 16, 20 and 30 which would suit your specific needs. No alloy was used in fastening the wires to the board, but through the use of a crimping method, which makes it more flexible and mechanically stronger. The crimps are well engineered to be air-tight, preventing oxygen and moisture from reaching the metals, causing corrosion. The solder tabs are made up of brass, copper undercoated or tin-plated. A special feature of the 1.25mm pitch connector is it can withstand lower temperature settings than the 0.8mm pitch connector and 1.0mm pitch connector which makes it more suitable for equipment that experience wide range of temperature difference. The temperature range for this connector is -40 degrees centigrade to +85 degrees centigrade. This range is based on the rise of temperature with increasing current. The connector can be used with the wires of AWG within the range of #26 to #32. This applies to wire diameters as small as 0.22mm to 0.4mm. Superfine wires such as these can help the routing job. Twin U-slot section or twinaxial cable or tuning-fork style has a pair of insulated conductors where the conductors are run parallel with one another. This is commonly used in high speed balanced-mode multiplexed transmission in large computer systems, in which the signals are carried by both conductors in a U-shaped configuration. This ensures reliable connection and provides greater noise immunity. As compared with the Molex 1.25mm PicoBlade, the 1.25mm PanelMate is manufactured with lesser infill housing making it denser, more flexible and less rigid than the PicoBlade connector. With its very thin receptacle design, 1.25 mm pitch PanelMate serves as the best choice for flat panel displays. Since its popularity in flat panel displays became a rave in the modern consumer electronics industry, the 1.25mm PanelMate connector plays a vital role in producing high-resolution displays in portable consumer products such as tablets, smartphones, digital cameras, camcorders, point-and-shoot cameras, and pocket video cameras. 1.25mm pitch connectors ensure safety, system protection and performance with its bonded metallic conduits and multiple grounding points preventing fire hazards, component damage, overheating and possible electrocution.